Over a week ago, I received a Thrillist email newsletter detailing a bar crawl in DTLA sponsored by Bols Genever. There were simple instructions to email barman Marcos Tello, formerly of the Edison, the Doheny, the Tar Pit and Seven Grand. 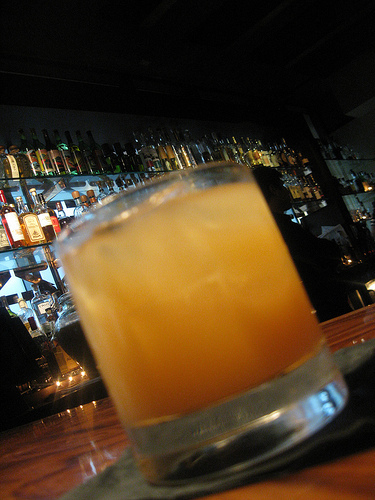 Marcos also has his own cocktail consulting business with partner Aidan Demarest, Tello/Demarest Liquid Assets. I had heard they worked on First & Hope‘s cocktails (Aidan was the bar manager and Marcos consulted) and now they are just finishing up consulting on the Raymond’s 1886 bar menu. I decided I wanted to check out the crawl and sent in a RSVP. Later I would learn space was very limited and I was one of the lucky few who go into this crawl consisting of 30 or so people. There were over a hundred RSVPs which was unsurprising but I’m shocked there weren’t more considering this crawl was featuring free and discounted cocktails. Then again, it was a Monday night and only crazy cocktailians like me consider it normal to be drinkin’ on a Monday night. When I first walked into Rivera, the starting point of the Punch Crawl, I was slightly confused. I thought this “open-to-the-public” crawl was going to be filled with food and cocktail writer friends. Or at least “normal” folk. Nope, the crawl was mostly industry people. Restaurant and bar industry people. I recognized some local barmen and women Drago Centro, Cana, Bottega Louie and would late meet bar folk from First and Hope, the Raymond, upcoming Hollywood bars and serious “enthusiasts.” They are normally behind the bar but were now converging to go bar-crawling. Basically it felt like I crashed an Industry party even though my RSVP had been accepted. Now knowing I was probably the only blogger (there may have been others but I didn’t meet them), I had to start taking notes. Normally I rely on my sometimes elephantine memory but usually truth be told, I really rely on “research” (aka, frantic googling). I knew I couldn’t do that this time around so to the best of my ability, I’m going to tell you what I had. 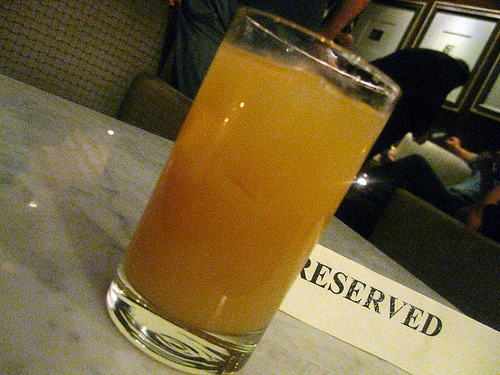 The Holland Jew at Rivera consisted of Bols Genever, 2 kinds of beer and um…yeah, okay maybe I should just drink? ** I’ve edited this post to include the drink recipes at the end of the post. I understand this punch will be available soon on the bar menu. **Please see the end of the post for drink recipes. We had been spending about an hour, an hour and half at each location and now we were at the third stop, Checkers at the Hilton. At this point, I’m starting to wonder why I didn’t take pictures of the punch bowls which were far more interesting than these unadorned glasses of punch (then again, maybe punch doesn’t need extra gee gaws to make them taste good?). Tyler Dow at Checkers emphasized to me the name of this punch had a hyphen in it; the Sydney-Town punch. It had pineapple gum in it which was interesting. We are now at our fourth and final stop, the Varnish. 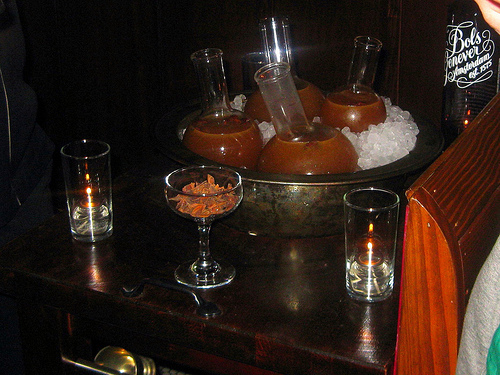 Instead of the punch being in big punch bowls, they were in beakers or more accurately, Florence flasks. Hence this punch being called the Florence flask punch. I detected absinthe along with Bols Genever. I was trying to be good and not use flash but anyone who has ever been in the Varnish knows the place is damn dark– just how I like my bars. 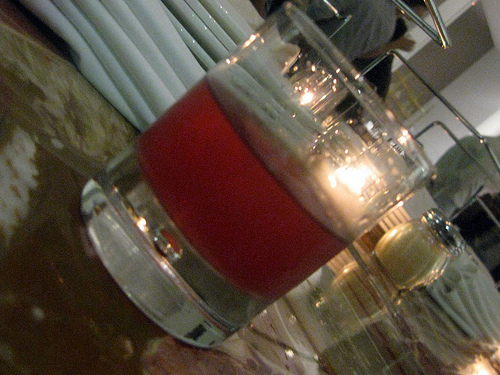 I finally conceded to use flash after the bartender from Drago Centro told me no one cared (or to feign ignorance). We crowded in and exchanged stories. I wistfully talked about going to Tales of the Cocktail next year in New Orleans and vets told me how to survive the trip. I also learned more about genever. I knew it was the predecessor of gin but I learned that most genevers are nothing like gin. 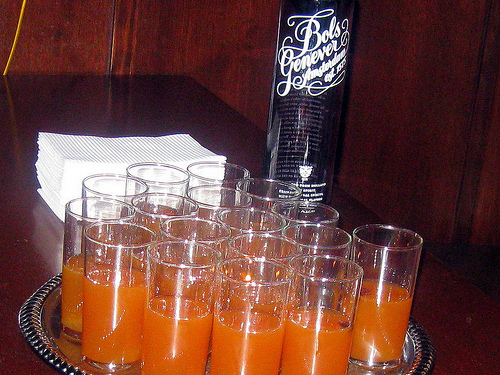 And Bols Genever has made it their mission to educate the American palate. If you mix genever and tonic together, you’d get a nasty mess. What you want to do is treat genever like whiskey, a white whiskey if you will. Make a Manhattan or an Old Fashioned and you’re doing great. Or do what the Dutch do and have it neat with a beer back. Hell, mix it with cola and that’ll do just fine. I had great fun on this bar crawl and it was fun to travel with such well-educated booze nerds. – 5 – 12 oz. Bottles of Hebrew R.I.P.A.